I’m away from home at the moment, hanging in San Francisco for a few weeks. All lovely and well, however, everyday my MacBook Pro is not connected to my 2Tb external drive and TimeMachine doing its thing every hour I lose another few hours from my life. Particularly having recently enjoyed major calamity with an OSX update that necessitated most of a day perched at the local Genius Bar to repair. What I *really* need is the ability to backup sets of files each night to my Dropbox account. It’s not TimeMachine of course, but a daily backup of key work files goes a long way to alleviating my anxiety. Tonight I sat down to make this happen – and discovered how easy it was. 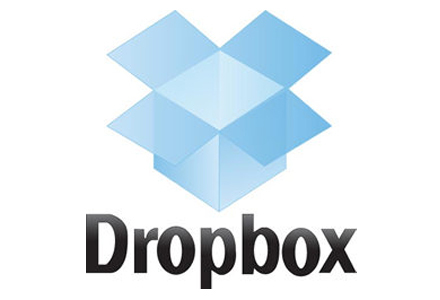 The key to all this, whether Mac or Windows, is that whatever you want to be on Dropbox needs to be in the Dropbox folder on your computer. So the trick is how to copy or syncronize your work files over to the Dropbox folder at regular intervals – eg once a day. The Mac solution involves using that Swiss Army Knife – the Automator. Along with Preview this has to be one of the handiest gadgets tucked away on your Mac that I suspect the majority of users never touch. 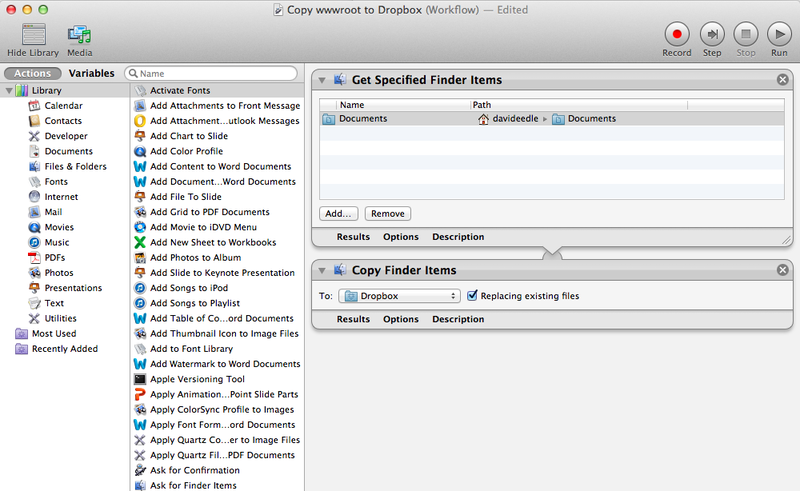 Here’s an article explaining how to use Automator to create and schedule a workflow that will copy any files you like from anywhere on your Mac into your Dropbox folder. I have Windows 7 running in Parallels on my Mac. Very few of the files in the Windows drive are irreplaceable. Almost all of them are part of code bases, and thus part of source control – either TFS or Github. Which means, on the whole, they exist somewhere else in the cloud. But some, even if in source control, I prioritise highly because they consitute key property that I’d *really* hate to lose. So a copy in Dropbox lets me sleep a little sounder. My discovery of the day? 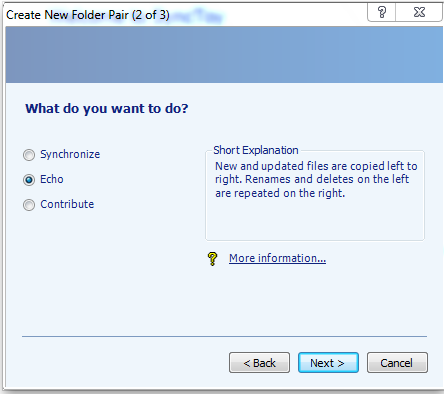 Microsoft SyncToy, a free tool that can keep two folders on your computer in sync. I followed the instructions in this handy blog post and was up and running in no time. On the left I chose the local folder on my Windows C:. 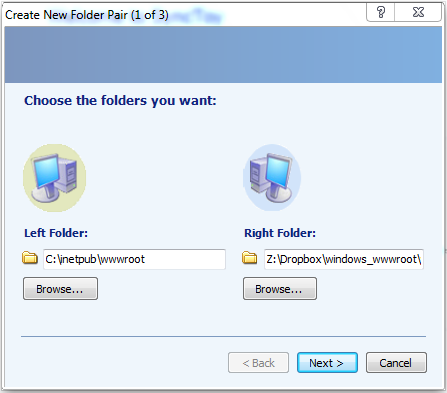 On the right I chose my Dropbox folder on my Mac hard drive. I did ponder the sync options for a moment. ‘Synchronize’ means it’s going to keep the folders in exact sync – so if something happens to my Dropbox folder – like I have a glass of wine too many and decide to do some pruning, it could reflect back to the original files. Instead I chose ‘Echo’ – that’s a one way street, pushing file changes to the DropBox folder, which makes sense to me for the task at hand. You can use Windows Task Scheduler to automatically fire the sync action. I have a nice and fast Comcast cable connection in the San Francisco apartment, so the initial push of all the files up to DropBox didn’t take that long. I pay $9 a month for the 100Gb storage option, so unlikely to run out of space in the near future.